Just as with IP addresses, in many cases the configurator sets up routes in a network properly without any user input. This step demonstrates the default configuration for routing. description = "Fully automatic static routing table configuration"
addStaticRoutes = default(true): This is the main switch that turns on automatically filling routing tables. When this setting is turned off, only routes specified in the XML configuration are added, and all the following parameters are ignored. addDefaultRoutes = default(true): Add a default route if all routes from a node go through the same gateway. This is often the case with hosts, which usually connect to a network via a single interface. addSubnetRoutes = default(true): Optimize routing tables by adding routes towards subnets instead of individual interfaces. optimizeRoutes = default(true): Optimize routing tables by merging entries where possible. We add some traffic to the network so that we can see which way packets are routed. We use ping applications for this purpose throughout the tutorial. In this step, we configure host1 to ping host7 in order to see the route between the two hosts. 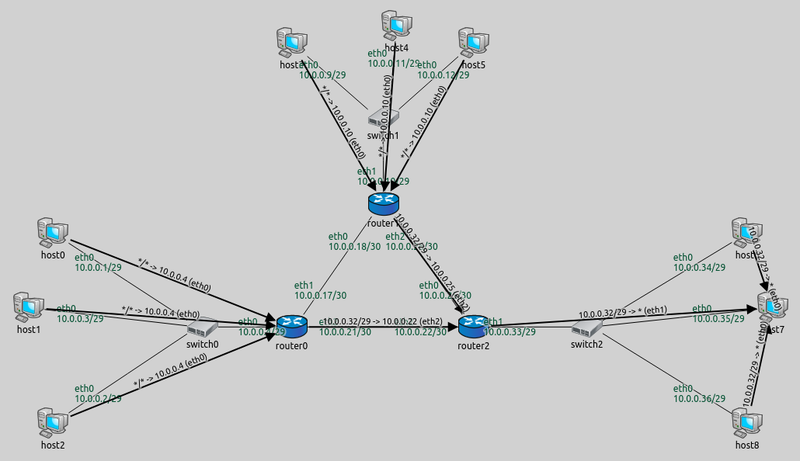 The RoutingTableCanvasVisualizer module (present in the network as a submodule of IntegratedCanvasVisualizer) can be used to visualize IP routes in the network. Routes are visualized with arrows. In general, an arrow indicates an entry in the source host’s routing table. It points to the host that is the next hop or gateway for that routing table entry. The visualization is activated by setting the RoutingTableVisualizer’s displayRoutingTables parameter to true. The set of routes to be visualized are selected with the visualizer’s destinationFilter and nodeFilter parameters. All routes leading towards the selected set of destinations from the selected set of source nodes are indicated by arrows. The default setting for both parameters is "*", which visualizes all routes going from every node to every other node. Visualizing routes from all nodes to all destinations can often make the screen cluttered. In this step the destinationFilter is set to visualize all routes heading towards host7. The dumpTopology, dumpLinks and dumpRoutes parameters are set to true. These parameter settings instruct the configurator to print to the module output the topology of the network, the recognized network links, and the routing tables of all nodes, respectively. Topology describes which nodes are connected to which nodes. Hosts that can directly reach each other (i.e. the next hop is the destination), are considered to be on the same link. The General configuration also sets up GlobalArp to keep the packet exchanges simpler. GlobalArp fills the ARP tables of all nodes in advance, so when the simulation begins no ARP exchanges are necessary. The **.routingTable.netmaskRoutes = "" line keeps the routing table modules from adding netmask routes to the routing tables. Netmask routes mean that nodes with the same netmask but different IP addresses should reach each other directly. These routes are also added by the configurator, so netmaskRoutes is turned off to avoid duplicate routes. Routes from all nodes to host7 are visualized. Note that arrows don’t go through switches, because they are not the next hop. When routes are concerned, switches are transparent L2 devices. The * for the gateway means that the gateway is the same as the destination. Hosts have a routing table entry to reach other nodes on the same subnet directly. They also have a default route with the router as the gateway for packets sent to outside-of-subnet addresses. Routers have three rules in their routing tables for reaching the other routers, specifically, those interfaces of the other routers that are not facing the hosts. Below is a video of host1 pinging host7.